Getting off the plane at Santiago airport felt like cheating. Ever since the bones of St James turned up at Santiago de Compostela more than a thousand years ago, pilgrims have trekked through Europe to visit what rapidly became Europe’s second most holy site, after only Rome itself. Some of Europe’s oldest highways were first laid out in order to facilitate the journey: they lead from as far away as Scandinavia and Poland and took pilgrims through France, over the Pyrenees and across the Spanish coastline. I walked out of the plane into a torrential spring downpour. I had left bright, crisp sunshine behind in England. Things were not going well so far. Santiago itself, though, more than made up for that. Like most Spanish cities, it is hard to distinguish the “modern” suburbs of Santiago from its spectacular medieval centre. In northern Europe, the 1960’s and 1970’s saw a profusion of Soviet-style tower-blocks spring up in a vulgar halo around many ancient city centers. Santiago has its modern architecture, of course, but set against the lush green of the surrounding hills and in the context of some of the most striking buildings in the whole of Spain, the majority of the city has managed to retain its historic charm. 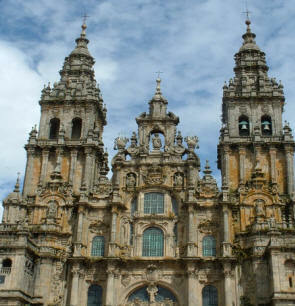 Rounding a corner and coming upon the massive Santiago cathedral is anexperience not to be forgotten in a hurry. The cathedral (the city’s first) was built in 829 and, ever since, it has been rebuilt, expanded and augmented by successive monarchs and dukes wishing to cement their place in history by some new and magnificent contribution to Santiago’s already overcrowded architectural heritage. The only leader to buck the trend was Mohammed ibn-Abi Amir, an agent of the Caliph of Cordoba, who, when he sacked Santiago in 997, razed the great church to its foundations. In the millennium since then, however, it has had plenty of time to recover. The sublime carvings on the cathedral’s famous western façade were completed in 1750 and constitute some of the most magnificent examples of western sculpture still in existence. It’s possible to stand for hours in the grand square opposite the cathedral and gaze at every detail of this beautifully precise and implausibly intricate masterpiece. If one did, though, one would probably get rather wet. Along with magnificent scenery and imposing churches, rain is a major feature of Santiago, but experiencing a good Santiago storm is well worth it; no other city I have ever visited glistens and sparkles in the wet quite like Santiago. Moreover, the weather is a good excuse to visit a bar. Gallicia is famous for its tapas — tasty bar snacks designed to make you order more beer (which, to me, seems like a very satisfactory arrangement). Every bar has its own speciality which will invariably be served free along with a drink. Seafood is popular — octopus being a particular favorite — but there are plenty of cured meats and cheeses as well. Such is the quantity of the tapas that it’s possible to consume a complete lunch just by going from bar to bar ordering nothing but drinks, being pleasantly surprised by whatever comes out accompanying them. The food in Spain generally is something special; Santiago is no exception. There is little extravagant cooking here. There are few famous restaurants and little opportunity for formal, tucked-in-shirt style dining. Yet the many small bars and restaurants serve cheap, delicious food in astonishing quantities. It’s all too easy to spend a whole afternoon grazing from bar to bar sampling their specialities. The Costa Blanca is an altogether very different experience. Ever since the late 1960s, Northern Europeans have been making an annual pilgrimage to Spain’s warm, sandy coasts to fry themselves to a striking shade of scarlet. The Spanish, though, know when they’re on to a good thing: by sacrificing the odd fishing village here and unspoiled stretch of virgin sand there, they have constructed a crescent of huge resorts stretching from Benidorm on the Costa Blanca round to Marbella. Old-fashioned, whitewashed fishermen’s shacks and the colorful markets that they once supplied have been swept away in favor of the towering spires of convoluted hotels all proudly boasting “we speak the English” on sandwich boards outside their doorways. 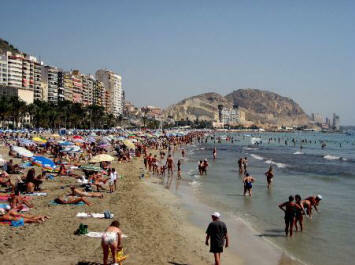 At first glance, the Costa Blanca (the name given to the coastline of the province of Alicante) does not seem to represent the most appealing prospect for a holiday given its tendency fill up with tourists during the summer. Unless you wish to spend a week cooking yourself on a beach, though, a car is an essential. Renting a car in Spain is relatively cheap and the new lease of life it gives is priceless. Though most of the coastal towns on the Costa Blanca are overrun with tourists during the high-season, there are one or two, like Denia (about forty-five minutes north of Calpe by car), that repay a visit with a vibrant fish market and an impressive Moorish castle. Getting away from the sea, though, takes you somewhere else entirely. 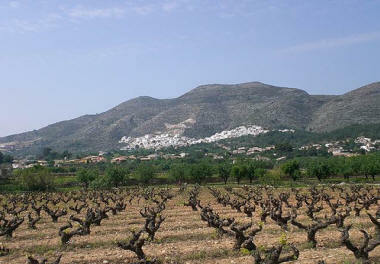 The Jalon valley (30 minutes from the coast) is famed for its wine which is rustic, fruity and unsophisticatedly delicious. The many “bodegas” which can be found in every town and village in this area each have a local speciality, decanted directly from barrels into empty water bottles. This is also the territory of the “typico” restaurant. You can easily spot these places. Often slightly run down or with a hint of 70’s chic, you hear them before you see them; this is where the locals go to shout at each other over generous plates of the day’s speciality. Still, there is no sense of you as an outsider: like everywhere else in Spain, you’re one of the crowd regardless of who you are or where you come from. You are seated and then given a choice of chicken, rabbit, beef or fish. Choose wisely, because throughout the afternoon plate after plate of food will be brought to your table, accompanied by more wine (the wine list gives you the choice of red, white or beer) than you believed could possibly exist in one place. The food itself is like everything else in this part of the world: unpretentious and vivacious. The real joy of it all is that the gas you used to get there and back will probably have cost you more than the meal. 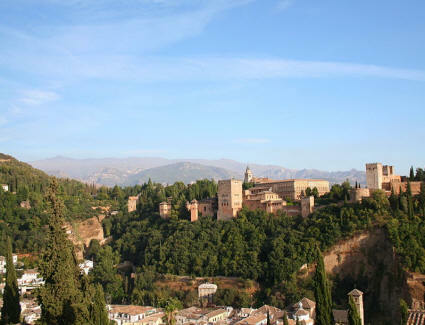 The final leg of my Spanish trip took me to Granada in the south of the country. Famous for the Alhambra palace and the magnificent architecture that sprang up to mirror it, Granada is only a few miles away from the port city of Malaga and just north of Spain’s most popular summer destination, the Costa del Sol. Given it’s location, during the height of summer it’s inundated by daytrippers. Set against the background of the Sierra Nevada national park, this place is set in some of the most dramatic country in Europe; the town itself, not to be outdone by its surroundings, boasts the Alhambra — Granada’s undeniable centrepiece — which is without question one of the most glorious building in all of Europe. A Moorish stronghold until the fifteenth century, there is a peculiar collision of styles here: Moorish domes and mosque-like structures mingle with gothic and baroque turrets giving Granada an almost theme-park-like quality. municipal buildings are subtly beautiful; even the way in which the different architectural styles vie with each other for superiority is something special. As with everywhere else, the food is memorable. Plates of tapas are unavoidable wherever you go. Even in the oppressive heat of southern Spain (Granada is barely two hundred miles from north Africa), eating and drinking is an essential pastime. Thankfully, though, chips are off the menu here.